Life will always be stranger than fiction and, in this case, life can give Final Destination a run for its money. 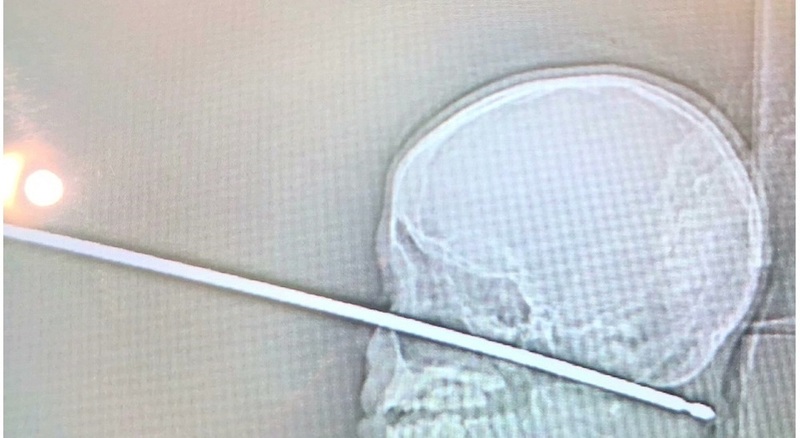 The following involves a 10 year old boy, Xavier Cunningham, a large metal meat skewer and a wasp's nest. Cunningham and his buddies were climbing into a tree house when a wasp landed on his hand. Panicked he tried to swat it away but in the process lost his balance and fell face-first to the ground — right where he and his friends had stuck a long metal meat skewer that they had found. Cunningham arose to find he was covered in wasps and the foot long skewer was protruding from his face. he proceeded to run towards his house, screaming, "Get them off me! Get them off me!" Cunningham’s surgeon said the skewer entered the boy’s face under his eye and traveled several inches through his skull, but it did not puncture the skin at the back of his head and it missed all of his major arteries. Also he will be sore for a while and may experience some voice changes because the skewer was so close to his vocal cords, but the surgeon does not foresee any significant impairment.